I love the monochromatic colors of this card! Almost everything is Pool Party, one of our delicious 2011-2013 In Colors! So light and refreshing it is! 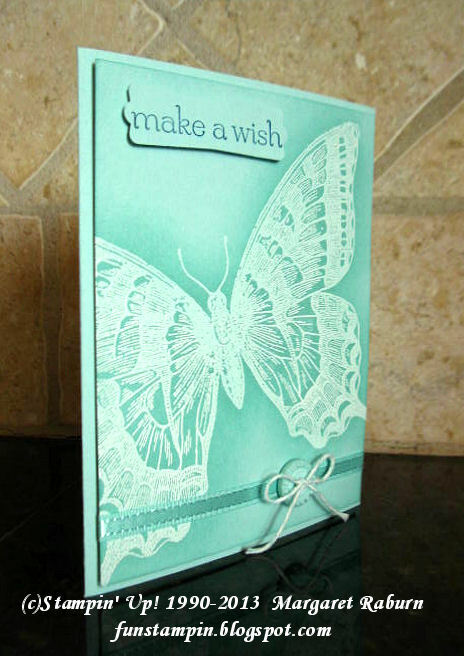 The Swallowtail is stamped in VersaMark onto a 4" x 5-1/4" piece of Pool Party cardstock then embossed with Pool Party Embossing Powder (#129398, $4.75, p. 12 Spring). To bring out the design more, I then sponged it with Pool Party ink; you can see the "shadow" behind the butterfly that results from the sponging and makes the image "pop"! 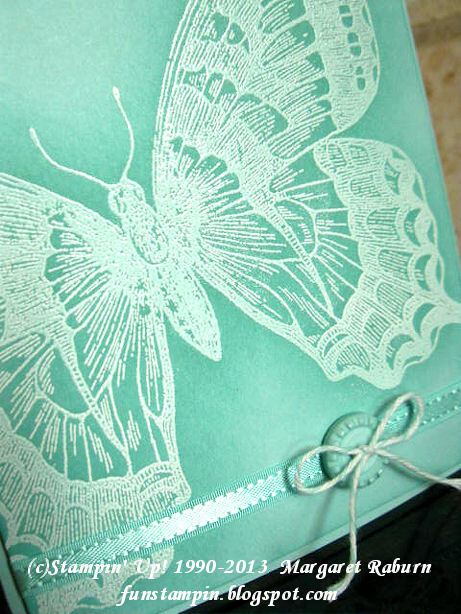 TIP: Be sure to wipe the embossing with a tissue to remove any ink that may remain from the sponging process. The luscious Pool Party 1/4" Satin Ribbon and button are from the free (with $50 purchase) Sale-a-Bration Sycamore Street Ribbon and Button Pack. The button was tied with Pool Party Baker's Twine before attaching to the ribbon. 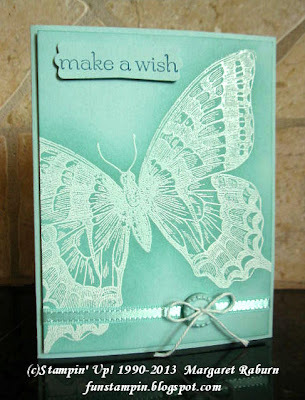 The "make a wish" sentiment is from the Sweet Essentials set of 8 (#126457). I stamped it in Island Indigo on Pool Party cardstock then punched it out with the Modern Label Punch then popped it up on Dimensionals. 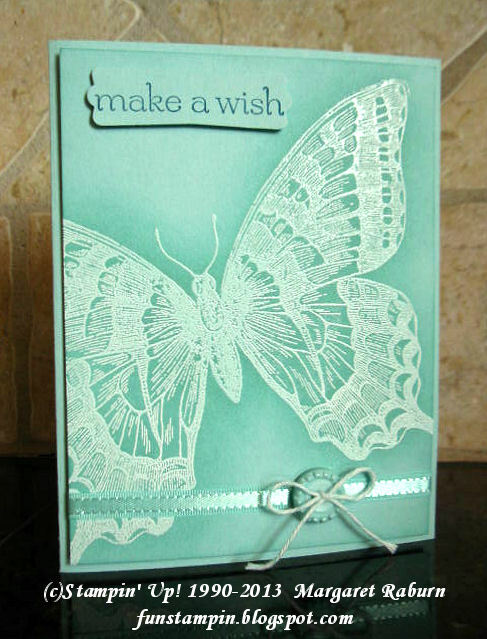 TIP: To add more depth and interest to a monochromatic card, layer the stamped cardstock onto a full card (8-1/2" x 5-1/2", folded in half) of the same color. It adds so much. Try it and see! I hope you've enjoyed the card today. Embossing Resist is an easy-peasy technique that adds so much to a project! Page 12, Stampin' Up! Spring 2013 Catalog. This is a stunning card. I love Pool Party and you certainly did do it justice.